Long Beach, Calif. – August 23, 2015 – Formula DRIFT presented by GoPro returned to Texas Motor Speedway for Round 6: Showdown. Japanese rookie Masashi Yokoi in the D-MAX Nissan S15 earns his first Formula DRIFT victory. The championship will be determined at the Series finale on October 10. Round 6: Showdown was an action packed event weekend. The new course configuration at Texas Motor Speedway proved to be challenging and highly competitive for the drivers. With only one event remaining in the 2015 season a champion will be crowned at the season finale at Irwindale Speedway. Over 400,000 fans tuned in live throughout the event weekend on the Driftstream. Points leader and number one qualifier, Fredric Aasbo lost in the Great 8 opening the chase for the championship up to the rest of the field. Aasbo will head into the championship with a considerable lead of 80 points. The semi-finals had Daigo Saito in the Achilles Radial Nissan GT-R face against his close friend Ken Gushi in the GReddy Performance / Hankook Tire Scion FR-S. Gushi was able to outdrive his opponent on his way to his third podium of the season. Yokoi battled Chris Forsberg in the NOS Energy Drink / Hankook Tire Nissan 370Z. Yokoi beat the former champion to head into the Finals. 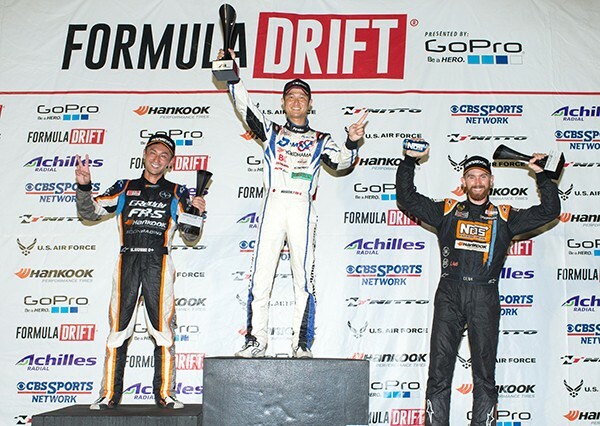 The Finals were close with the rookie Yokoi being awarded the win by the judges for his first podium and victory in Formula DRIFT. Gushi’s second place finish moves him into second place overall. The 2015 Formula DRIFT Pro Championship season will conclude at Round 7: Final Fight at Irwindale Speedway on October 9-10. For more information visit: www.formuladrift.com and find Formula DRIFT on Instagram, Facebook and Twitter. Tune into Formula DRIFT on CBS Sports and check your local listings for airtimes.